The HSD Research & Development department has designed a Right-Angle Head to machine and “clean up” the radius on the corners of panels. The aggregate achieves the specific goal of reducing panel machining time, as this operation would otherwise have to be carried out off-machine at a later time. • EXTREME PRECISION in creating the corner edge, with relevant simplification of subsequent finishing and assembly operations by using dedicated milling cutters. • GREATER PRODUCTIVITY as a result of the ability to carry out radius cleaning operations directly in the machine, even in closed windows of small dimensions and depth, thanks to the limited size of the aggregate body. • GREAT VERSATILITY of operation, thanks to the fact that the aggregate can be used with milling cutters and blades of different shapes for milling or cutting operations. An adequate “Z” height also makes it possible to machine very thick panels. 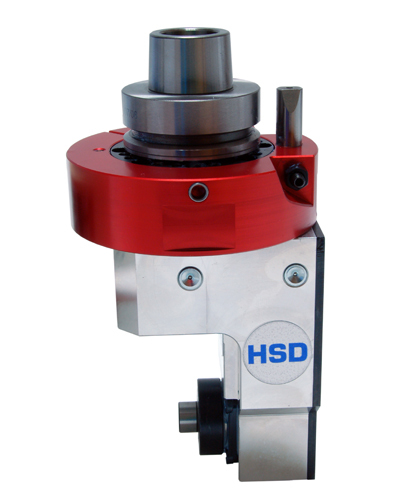 The overall rigidity of the system is guaranteed by a solid aluminium body machined from a single piece in which the housings for the tool support shaft bearings have been machined. The rigidity and stability of tool output is guaranteed over time, thanks both to the angular bearings on the cutter side and the radial support bearing on the back. The simplicity of use of the head derives from an extremely quick tool change system that simply involves loosening the 4 fixing screws. The use of ground wearproof WC/C tungsten carbide coated gears, casehardened shafts and high-precision bearings allow the high tool rotation speeds (12,000 rpm) required for the machining operations described above to be reached.